October | 2013 | cut it out, stitch it up! After a reasonably successful attempt at a t-shirt I was confident enough to make up the Kitschy Coo Girl Skater Dress for my daughter. 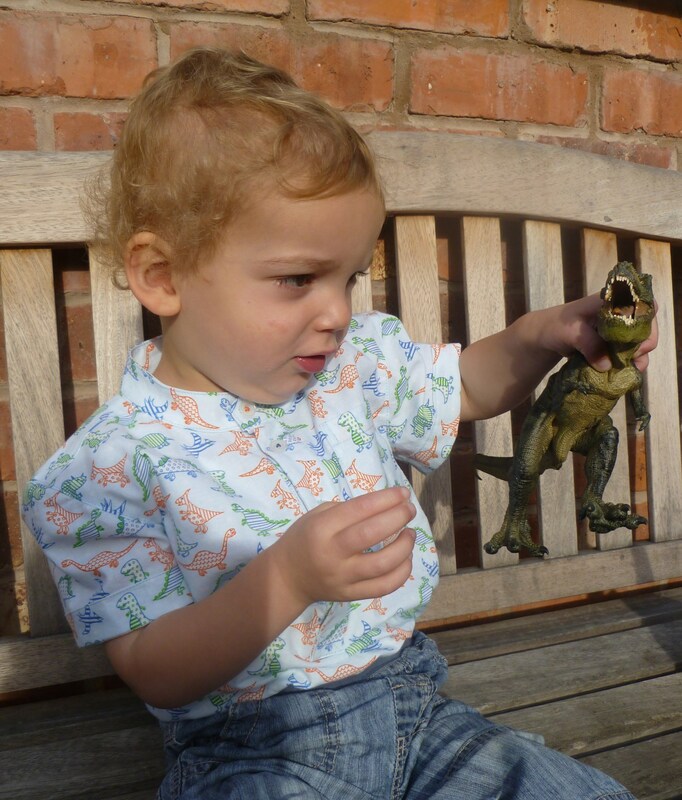 I was also spurred on by the fact that this week has been Kids Clothes Week. I’ve taken advantage of the extra hour we get today to get up early to write the post and upload to the KCW website. Here’s a link to my uploaded project. 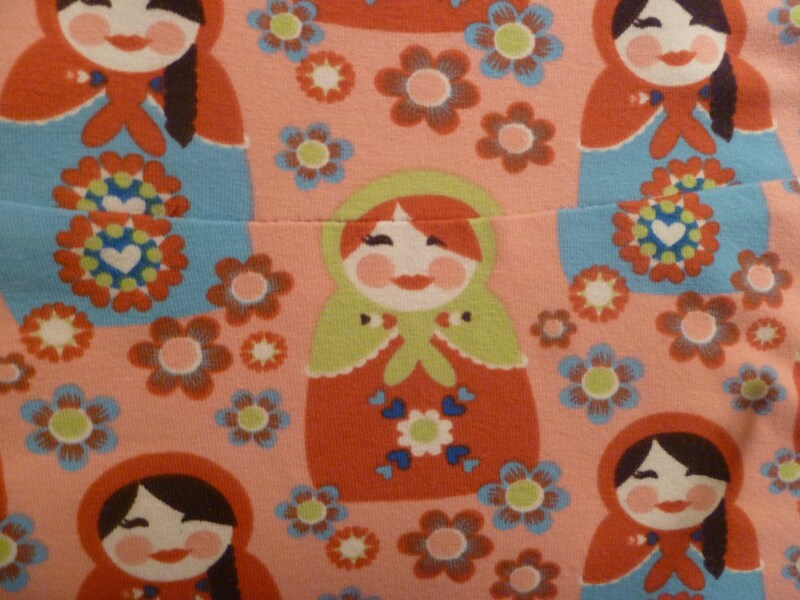 The single jersey fabric was ordered from Kitschy Coo, I let my daughter have a look at all the fabulous patterns and make the final choice and she chose the Russian dolls. 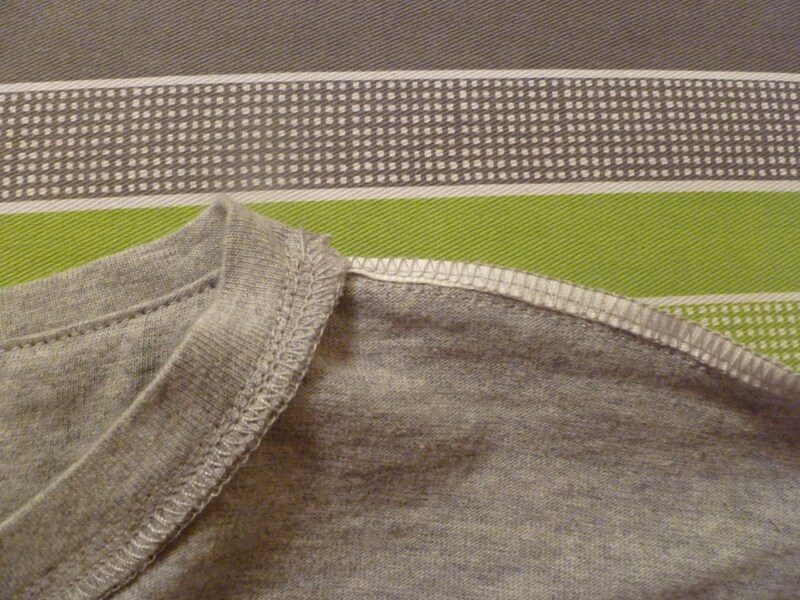 The fabric is 95% organic cotton 5% elastane. 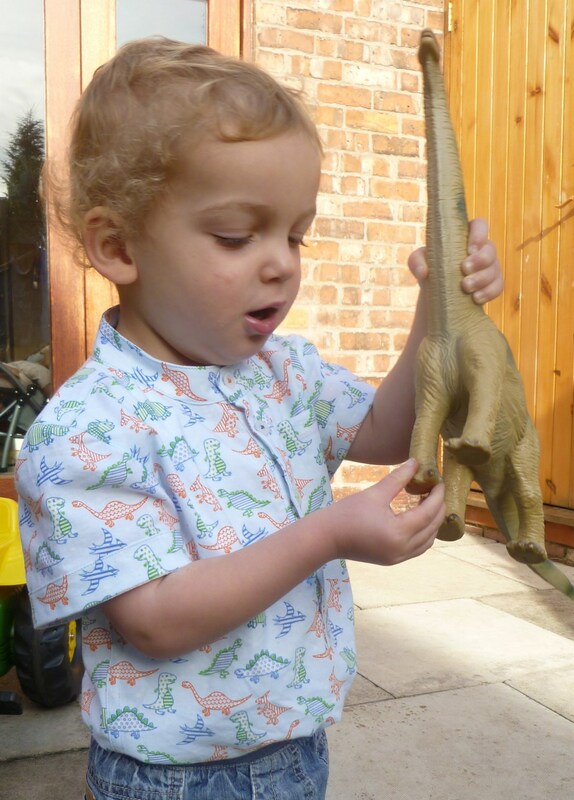 The dress pattern is a downloadable PDF so there is a bit of printing, cutting out and sticking before you can start. 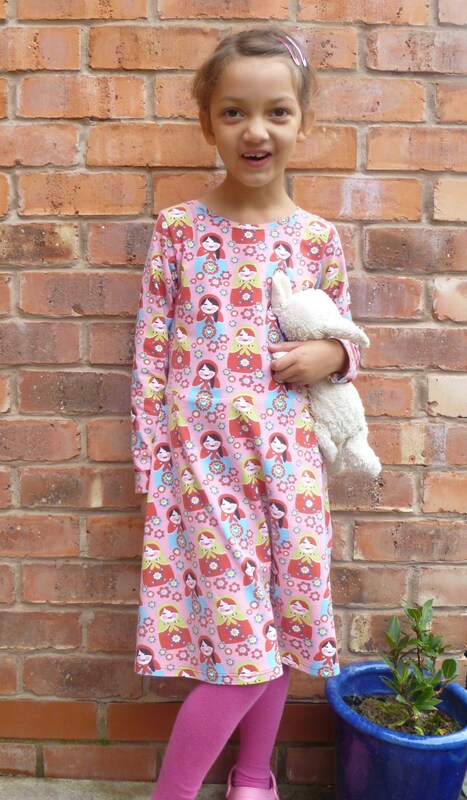 My daughter is just about to turn six but is very tall so I cut out the biggest size, 7 -8 years. With such a bold pattern making sure everything is straight is important so I followed the advice from the pattern instructions and traced so I had full pattern pieces, not just half to cut on fold. 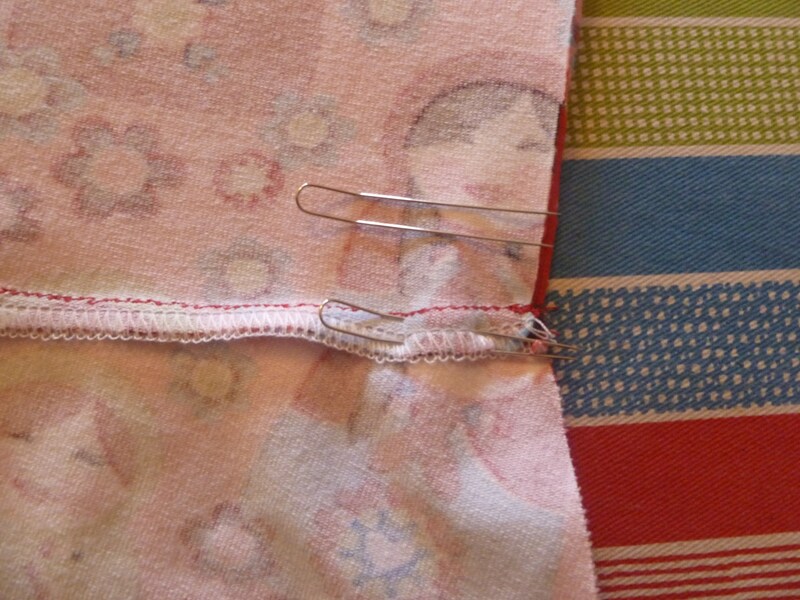 I sewed up using the stretch stitch on my standard sewing machine and neatening the seams with a 3 thread overlocker. I stabilised the shoulder seams with tape. One change I made to the sewing instructions was that I sewed both shoulder seams and stitched the neck band on in the round. The instructions left one shoulder open and to sew after applying the neck band. I had success with this method on the tee and so went with it again. 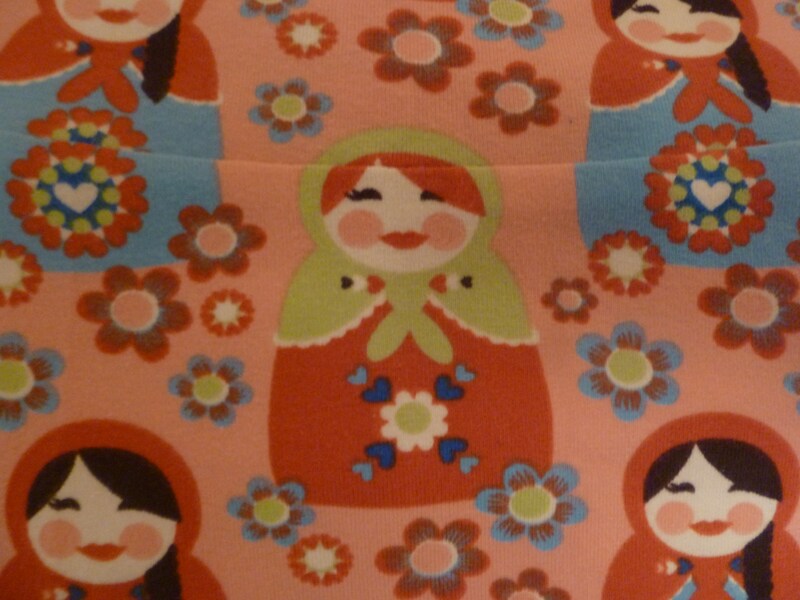 I had put some though into pattern matching and made sure the centre matched right down the front onto the skirt pieces on the front and back. I sewed the back skirt onto the bodice and was happy with the matching. 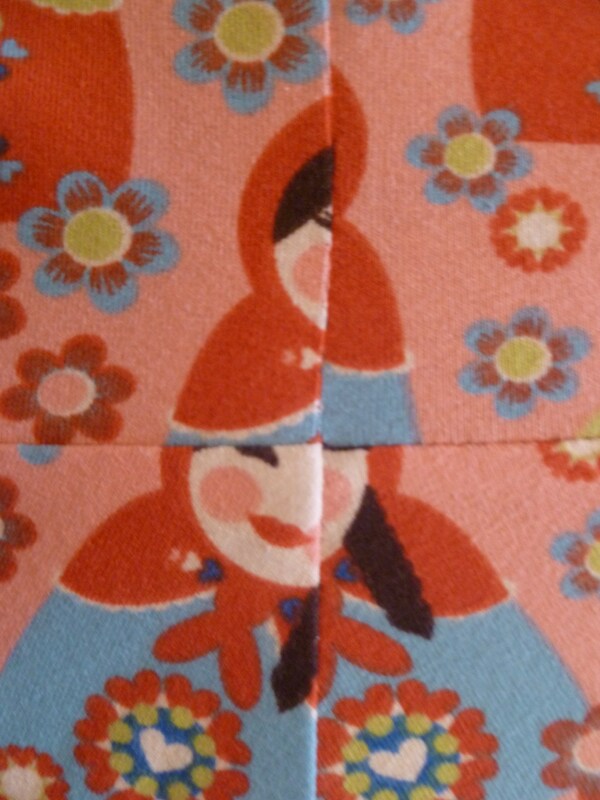 I then sewed the front, I had pinned but had obviously shifted and I was a bit disappointed with this. I couldn’t leave it as it was so attempted to unpick the stretch stitch (2 stitches forward, 1 stitch back) it was a slow going nightmare with the possibility of ripping a hole every time I put the quick-unpick in. After 40 minutes I’d managed 3 inches either side of the centre front and this was enough to shift the pattern along a bit. It’s not perfect but I can live with it. A lesson was learnt here, so from that point on I tacked using the biggest straight stitch on places that needed to match perfectly. Before I attached the sleeves I fitted the dress, as even though my daughter is tall she is very slim. So I took the side seams back to the 5-6 years width. I attached the sleeves then sewed the underarm from the cuff edge down the side seam to the skirt hem. Because I had learnt a lesson I pinned then tacked the points that needed to match at the underarm and the waist. I use these great Clover fork pins. These hold your fabric in place and it doesn’t shift at all. I then machine tacked 1″ above and below the seam. I attached the cuffs then I used a twin needle for the hem, hand tacking just like I did on the tee then sewing with the tacking line centred between the needles. Finshed! It is a really quick dress to put together, it would be even quicker if I could get the 4 threads working on the overlocker and avoid unpicking. 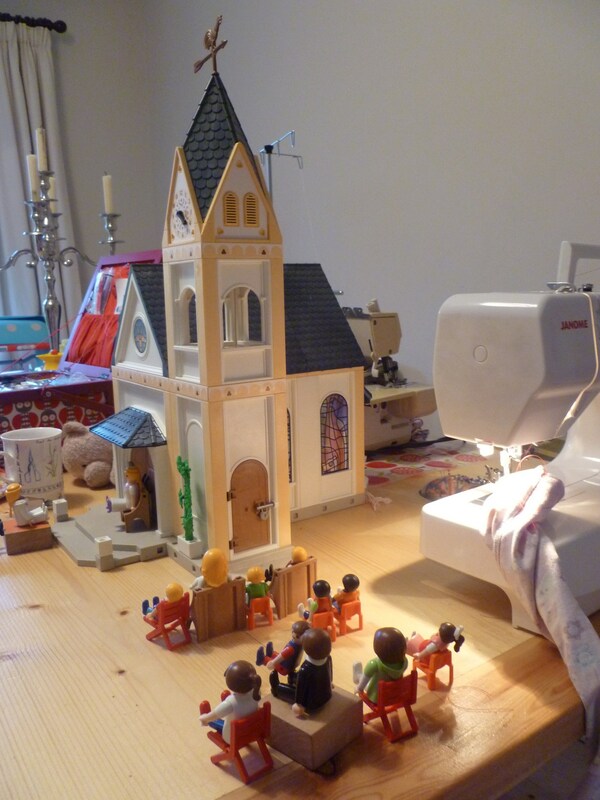 I even managed to fit in some Saturday afternoon sewing but had to share the dining room table with a Playmobil wedding. The client LOVES the dress! On the first day back at school after half term Year 1 will be having a fashion show and this will be worn plus it is her birthday so she will love it. 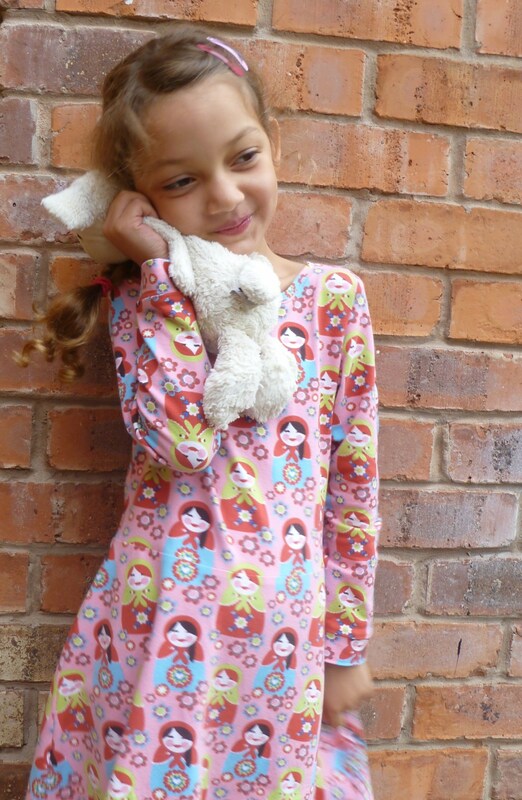 If you take a visit over to Fiona at Seams Straightforward you have the chance to enter into a pattern giveaway. It’s part of the ‘plus size pattern pyramid’. Just leave a comment for your chance to win! I needed to get over my fear of sewing with knits as I’m planning to make my daughter the Kitschy coo little girl skater dress. 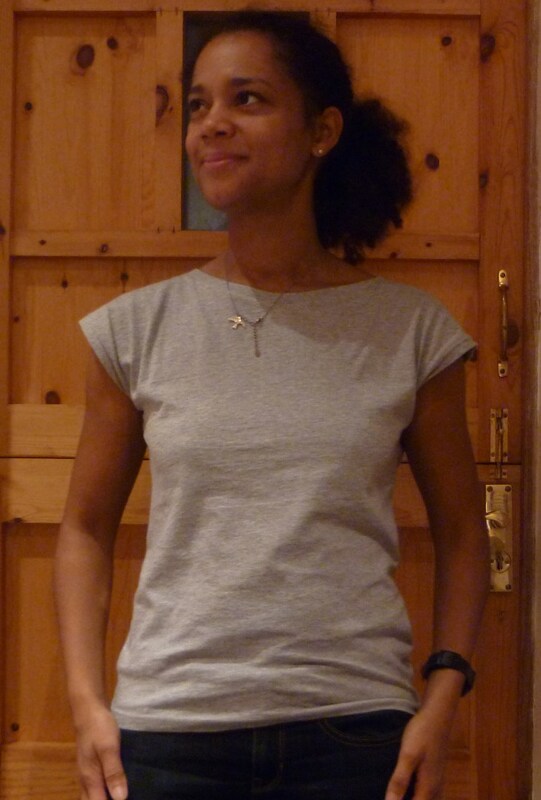 I’ve started simple with the Maria of Denmark Kimono tee which is a free download pattern. 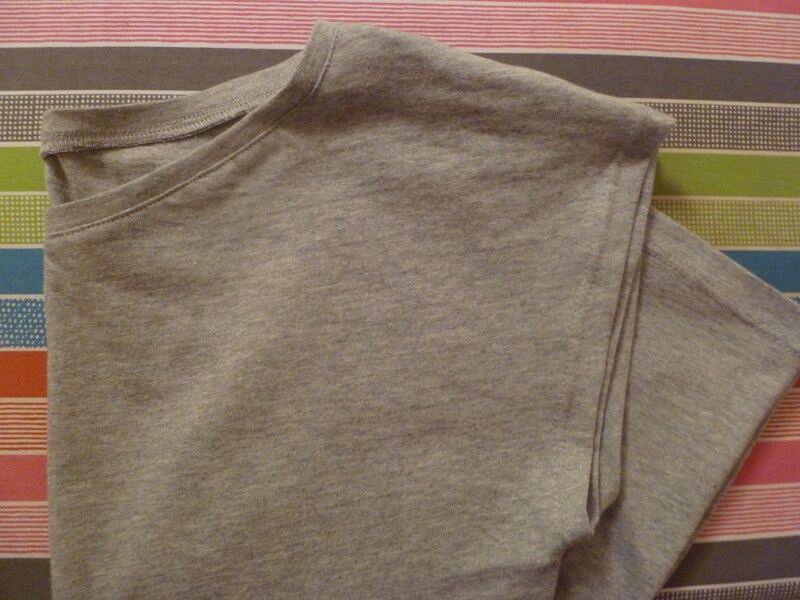 I bought some cotton grey marl single jersey t-shirt fabric for a bargain in Abakan in Manchester city centre. The amount of fabric I needed cost less than £2. Fabrics can be bought by weight, so you have a rummage and get the amount you want cut off. The pattern does suggest to use fabric with some lycra content in, the fabric I bought wasn’t labelled but I think it is just 100% cotton single jersey but I don’t this this has affected the fit. To start off I read some great tutorials and advice on-line. I ordered all the right needles. Ball point needles and a twin ball point needle for the standard sewing machine. Ball point needles are a must. The needles have a rounded tip which pushes yarns to one side rather than piercing the yarns in the fabric. 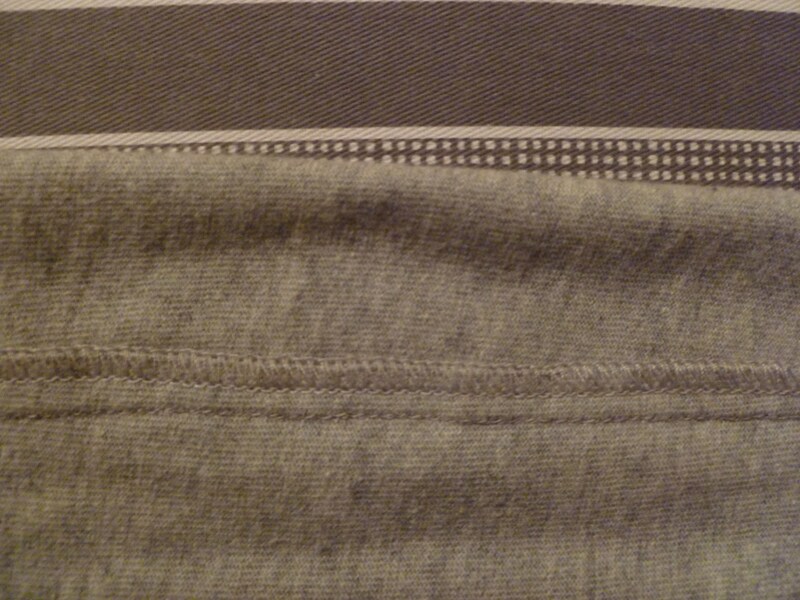 Using a standard needle can result in holes along the seam line. Using a twin needle for the hems gives you the effect you see on many t-shirts which would usually be done using a coverstitch machine. I hoped that I could also try sewing up by overlocking with 4 threads. 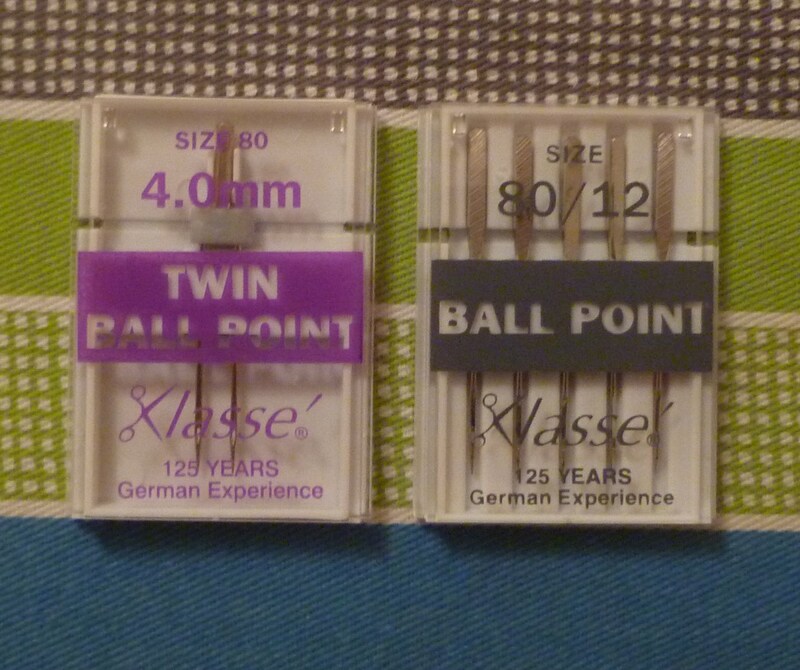 Firstly I couldn’t get any ballpoint needles for my Singer machine, they only seem to be available in the US and then when I came to add the extra needle and thread up to use as a 4 thread, I just couldn’t get the tension right, so I gave up with that idea. I used on of the stretch stitch on my machine which is a triple stitch, 2 stitches forward and one stitch back. It’s quite slow going but gives good results. 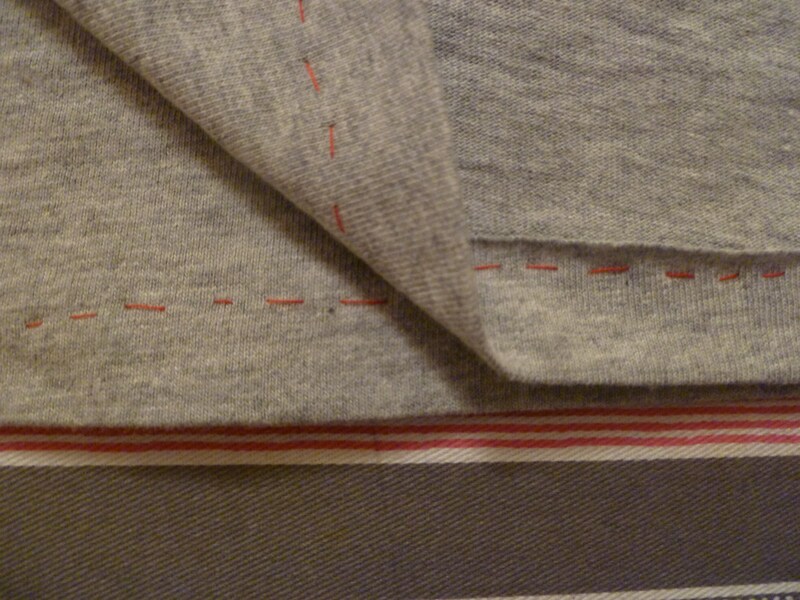 I neatened the seam allowances by using the overlocker on the 3 thread setting. I wasn’t bothered about not having a ball point needle as this was just neatening the seam and not creating a seam where any strain would be placed. Normally you find that the shoulder seams in knits are stabilised as the weight of fabric hanging from the shoulders can stretch the seam out of shape. There are a number of methods which can be used. Self fabric, twill tape, clear elastic. I tried the clear elastic method, firstly by sewing it at the same time I stitched the seam, this didn’t work and then by sewing it in the seam allowance. This also wasn’t working for me. Even though I was trying to sew the elastic in relaxed without any tension stretching it I as finding it was still puckering the seam. I gave up and found some narrow lightweight petersham type ribbon which worked. Thinking about it afterwards I’m sure my problem was that I was using a standard foot which would have dragged and stretched the elastic. I don’t have a walking foot or a Teflon foot which I think would have helped. I used self-fabric for the neck band. 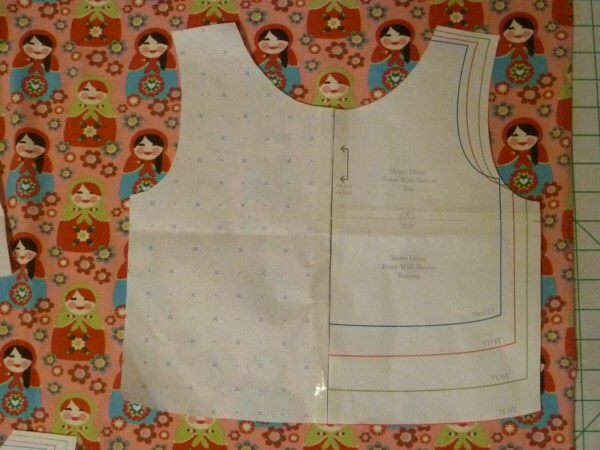 The instructions in the pattern tell you to cut the length 15% shorter than the neck opening and stretch on, pinning to the centre front, centre back and quarter points of the neck line. First time round I sewed to close to the edge and hadn’t left enough edge to over lock and in 3 or 4 places there were tiny tucks on the body fabric. I didn’t need to unpick the whole thing, just either side of the tucks (which was fortunate as the stretch stitch is a nightmare to unpick). I stitched around again taking a bigger seam allowance and making sure I stretched out the areas where the tucks had been. When twin needling the hems you need to sew with the right side of the fabric facing upwards. To make sure I caught the fabric in the stitching I tacked up the hems and used the tacking line as a central guide between the two needles. Because the single bobbin thread on the back zig-zags between the two rows on the front it gives a bit of stretch to the stitch. 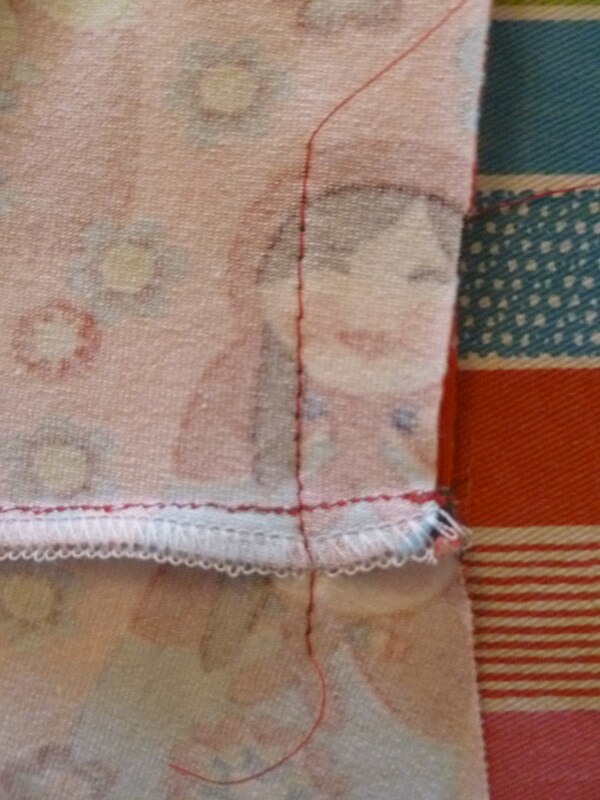 One tip I followed from ‘Melly Sews’ was to leave long ends, don’t backstitch or overlap and then bring front threads through to the back with a needle and secure. It’s just two pieces of fabric and a neck band and I have realised there is nothing scary about sewing with knits. I wore it to work the next day and I got a ‘nice top’ comment. Not bad for £2 worth of fabric and thread. Just as I was planning to make a shirt for my toddler I came across these instructions for drafting a shirt based entirely on the collar measurement which is 1 and 1/6th of the neck measurement. It’s blogged about here on the Offspring blog from a book dating back to 1910. I thought this was really interesting. The neck measurement I had was 24cm which gave me the collar measurement of 28cm. The body width is 1 1/2 times the collar length and and the body length is 3 3/4 the collar length which has the back and front cut all in one piece, so from the back hem over the shoulder to the front hem. 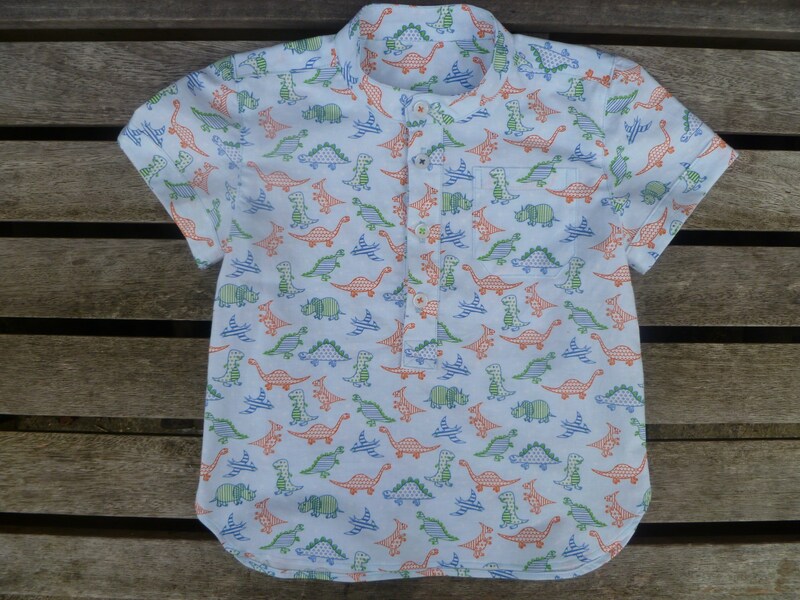 When I drafted this out it was turning out too wide and too long for what I wanted so I went back to the drawing board and took measurements from a current shirt but made slightly larger. I took the arm scythe measurement from the pattern and drafted the sleeve following the instructions in ‘Winifred Aldrich’ children’s wear book. I added a double layer back yoke which came slightly over the front shoulder. 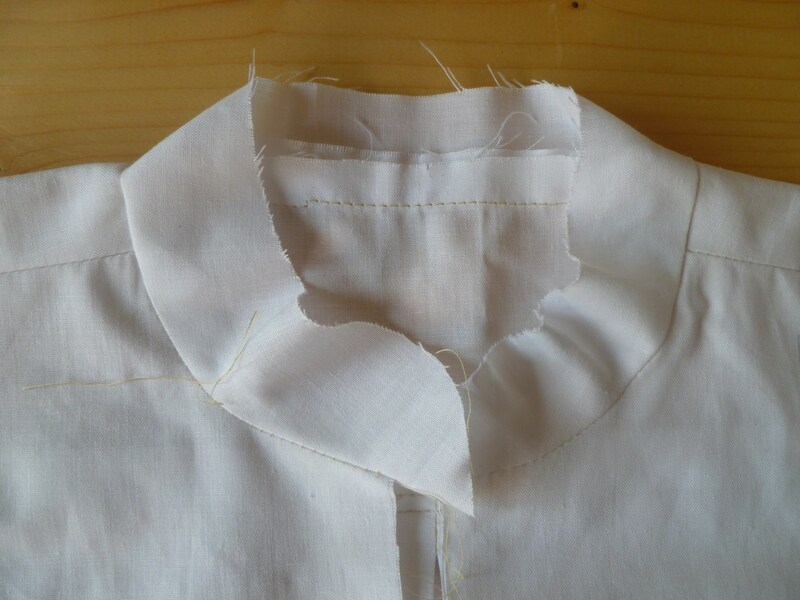 The front opening was to be a half-length placket with a stand collar. After fitting the toile it was too long and too wide. I took 1cm out of the width on the half both front and back and shortened the length. There was too much length in the top edge of the collar, more so on the front than the back. So I cut up the collar in 3 places and overlapped each piece by 3mm to shorten. The sleeve head had way too much ease, so I reduced the sleeve head height slightly which took out some of the ease. 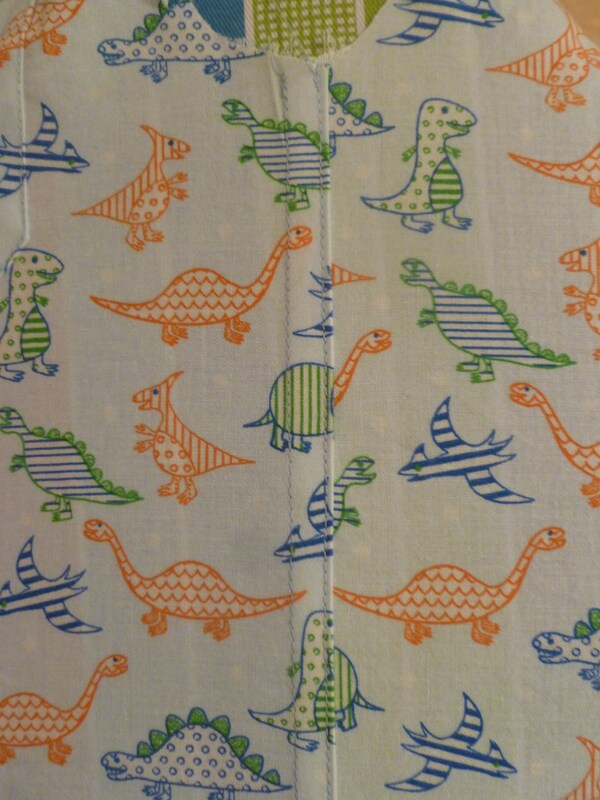 The dinosaur printed lightweight cotton fabric is from Fabric Rehab. I love looking at all the prints and with this one being ‘lightweight’ rather than ‘quilting weight’ as usually described I knew it would be suitable. Despite being confident with the half placket after a successful trial (previous post here) I managed to stuff up the real thing. When I came to fold over the top placket it just wasn’t wide enough. I could have just removed the placket and cut a new piece wider but I had trimmed the seam allowances to just a few millimetres and this affected the front body piece. So I marked where the fold needed to be which would be the stitching line and added a wider strip and completed in the usual way. The problem happened because I stitched slightly more than 10mm either side of the centre line, so instead of a gap of 2cm it was more like 2.5cm. I made the cuffs up as I went along. I added a strip to the bottom of the sleeve sewing right side of strip to wrong side of sleeve. 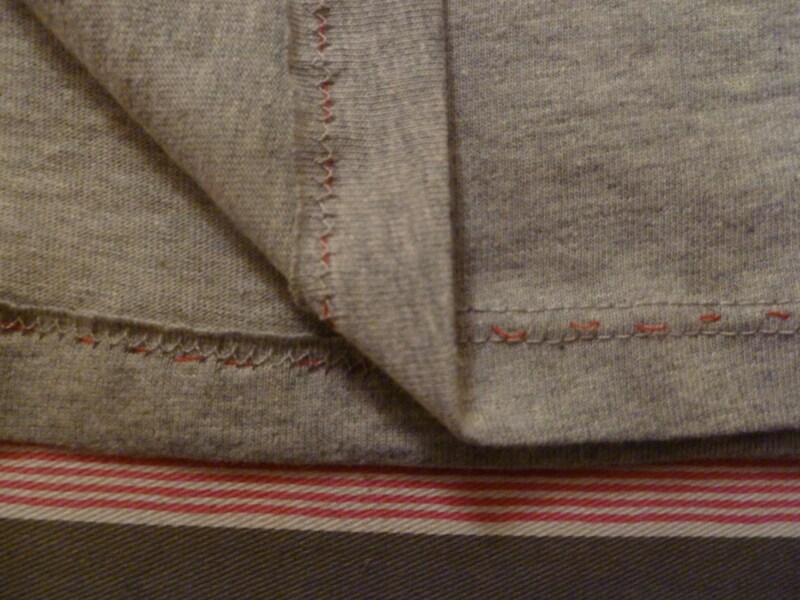 Pressed and folded up and stitched the top edge of the strip to the sleeve taking a tiny fold under hem. I then felled the underarm seams, sewing wrong sides together; trimming down one side of the seam allowance then pressing the top wider seam allowance over then taking a tiny turn under, stitched the seam and finished by stitching across the bottom edge. 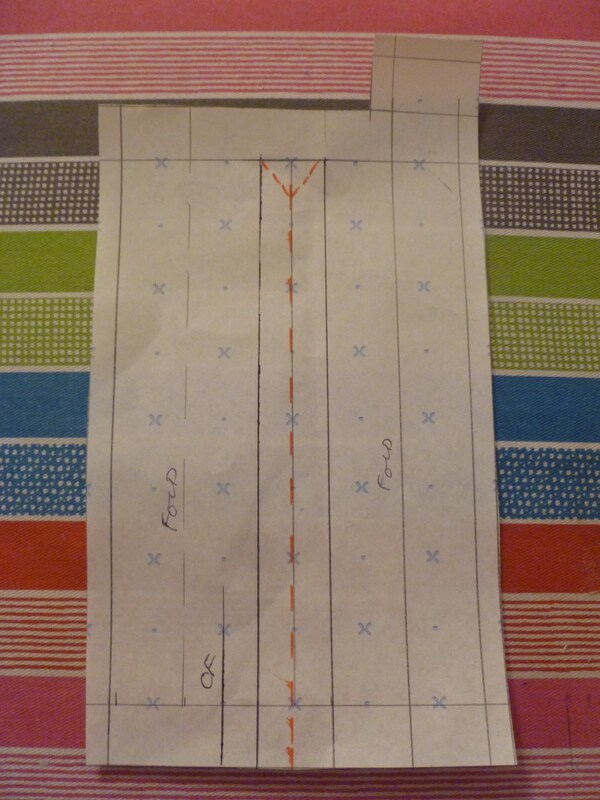 Here’s a link to instructions for a flat felled seam. 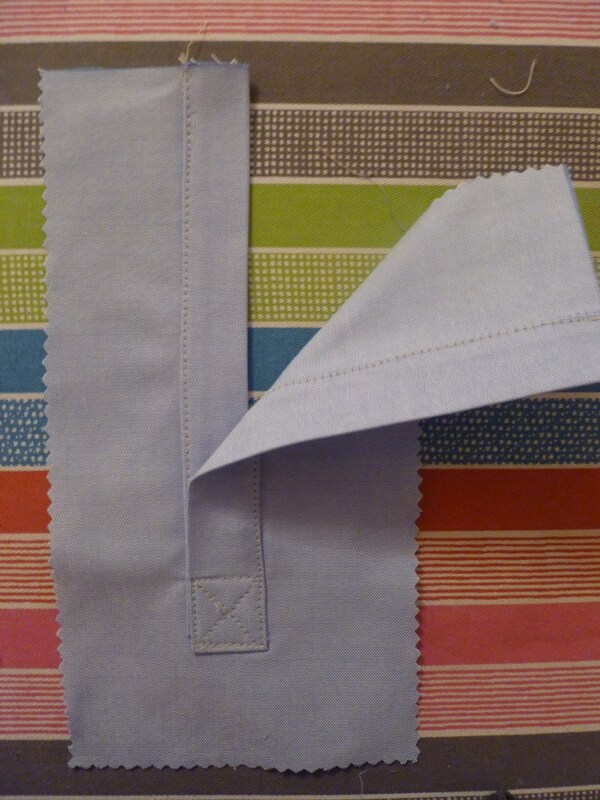 I used this seam on the side seams as they give a stronger finish and are traditionally used on shirts. I chose to stitch wrong sides together so you’d see two rows of stitching on the outside. 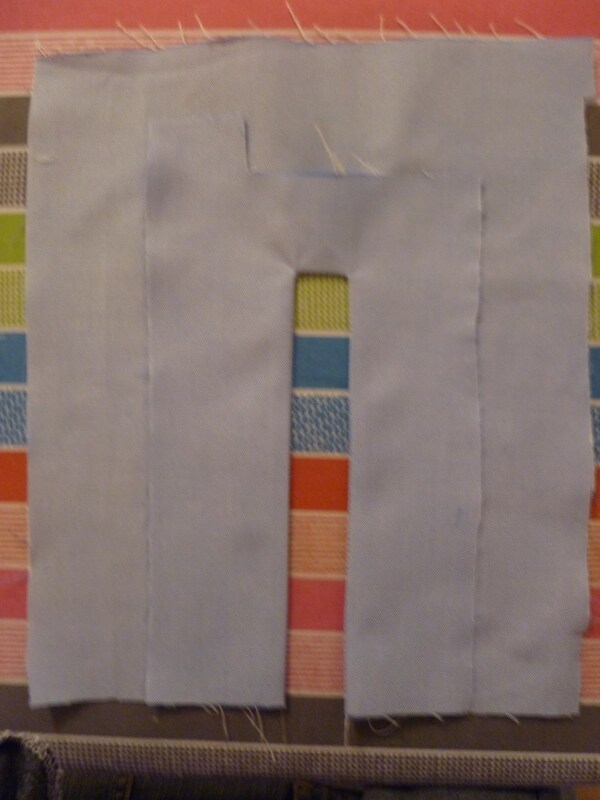 The sleeves were set in and neatened with the overlocker then topstitched and I made a tiny double fold for the hem. Finally the button holes, which always seem to cause me a problem, the one step buttonhole stitch on my machine seems to stitch the first side with a bigger / wider zigzag than the second side. No amount of twiddling seems to fix it. 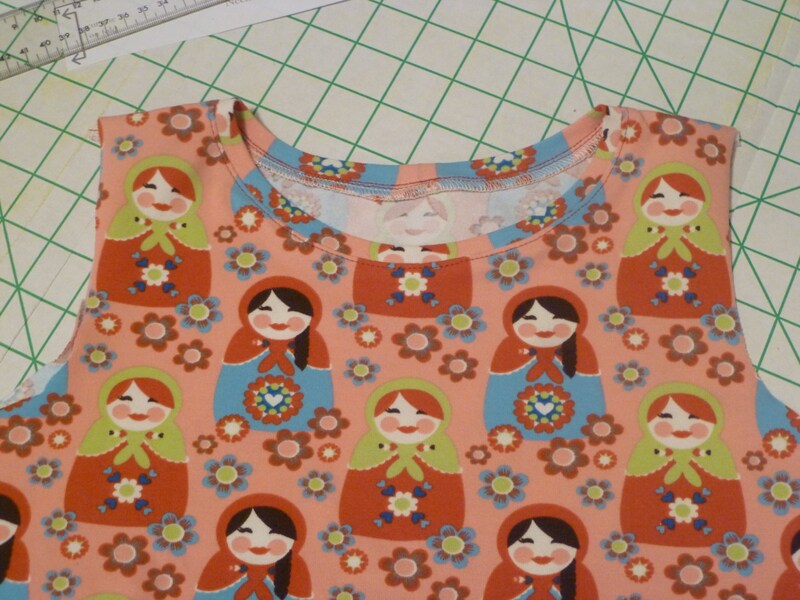 The one on the collar took 3 goes to get right and despite nicking the fabric with the seam ripper it looked OK. 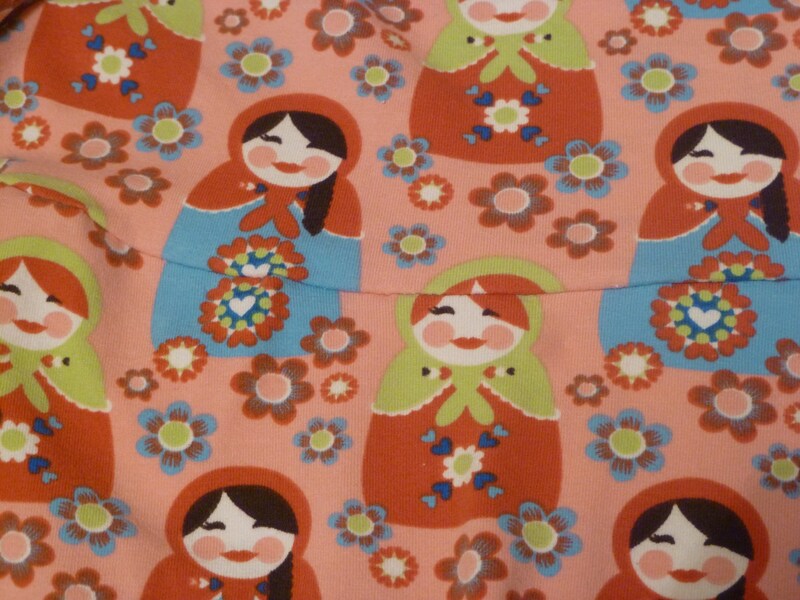 I finished by sewing the buttons on in 3 different colours of thread matching the print on the fabric. 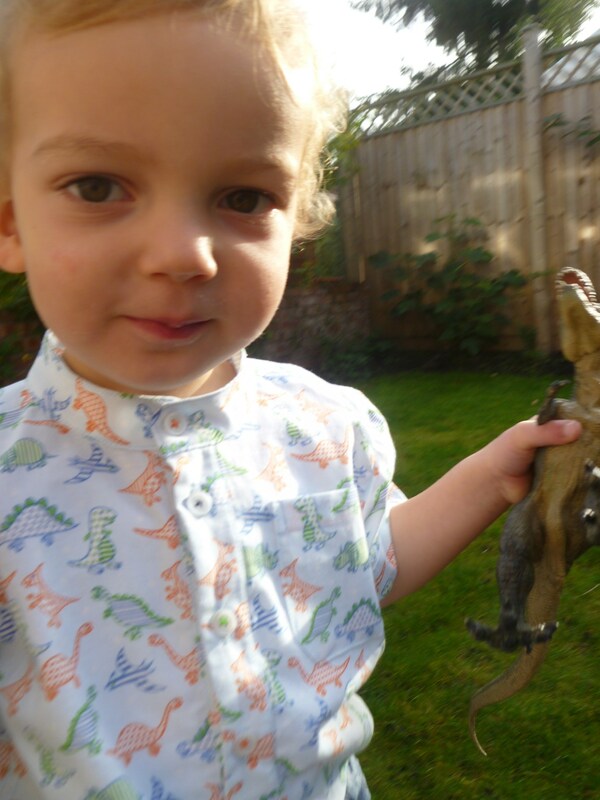 The finished article was greeted with enthusiasm and he was quite happy for a garden photo-shoot. There is plenty of growing room in this pattern and I’m sure it will get made up again for next summer. 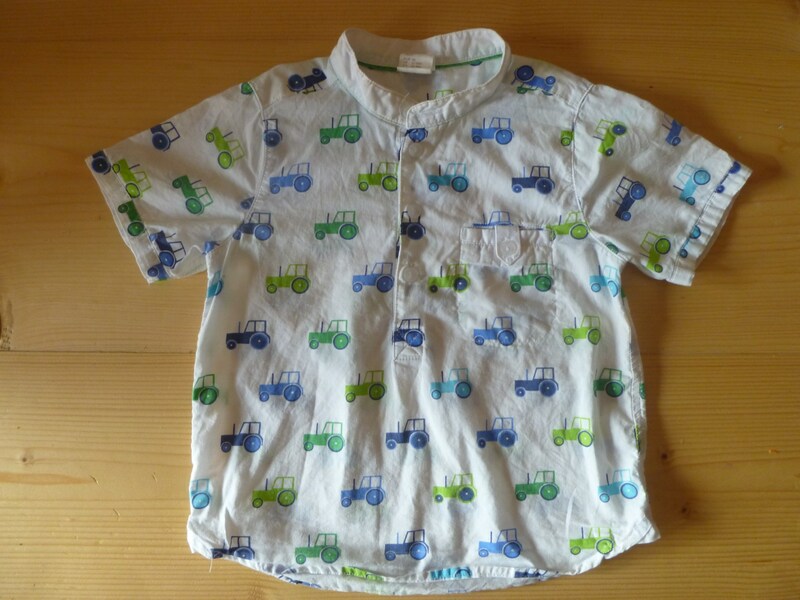 My next project is a shirt for my toddler. The plan is to copy the shape of a bought H&M shirt which is over the head with a half front button placket opening. 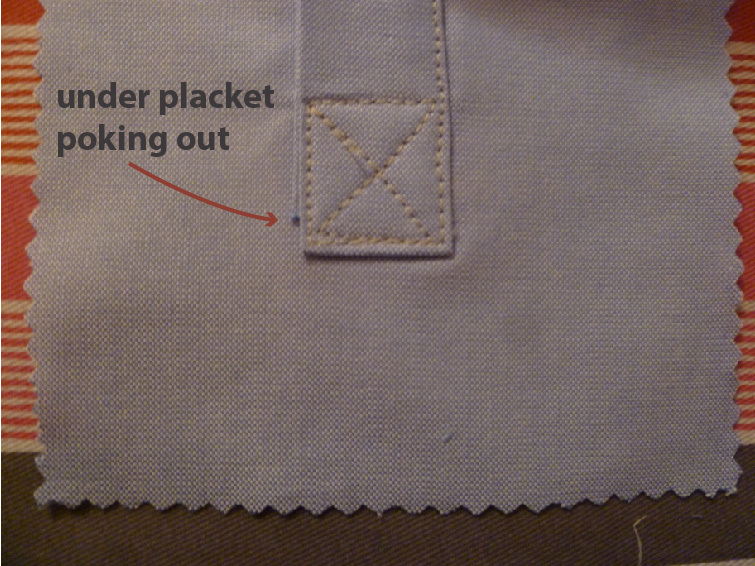 I’ve never sewn this type of placket before. 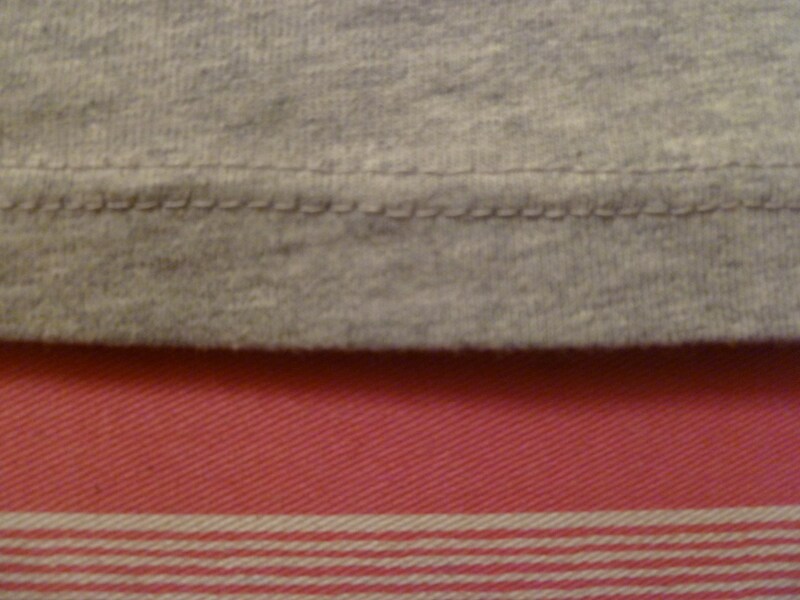 The H&M placket looks like it is two pieces of fabric and inside you can see a neatened raw edge at the base. Instead of muddling through I thought I’d look on-line for a tutorial. What I wanted was something similar to a cuff placket on a shirt. I came across this “Easy Sleeve Placket” on Burdastyle, to be honest I was surprised it was all one pattern piece, I wasn’t expecting that. If you don’t have a pattern there is a link in stage 2 to a YouTube tutorial to make one. I changed the pattern slightly, I didn’t want a V shape at the base and I needed the top and bottom placket to be the same width. Because I wanted this to be a button stand I used lightweight iron-on interfacing for the whole piece. I was half way through making up my first sample when I realised that the pattern wasn’t working. To accommodate the under placket (the under piece on a shirt cuff placket is usually much narrower than the top) I needed a wider space either side of the centre line. Also the interfacing had stiffened it too much so for the next sample I just put a strip on either side so when finished it would be single layer. I needed to make the distance from the cutting line on either side wider. 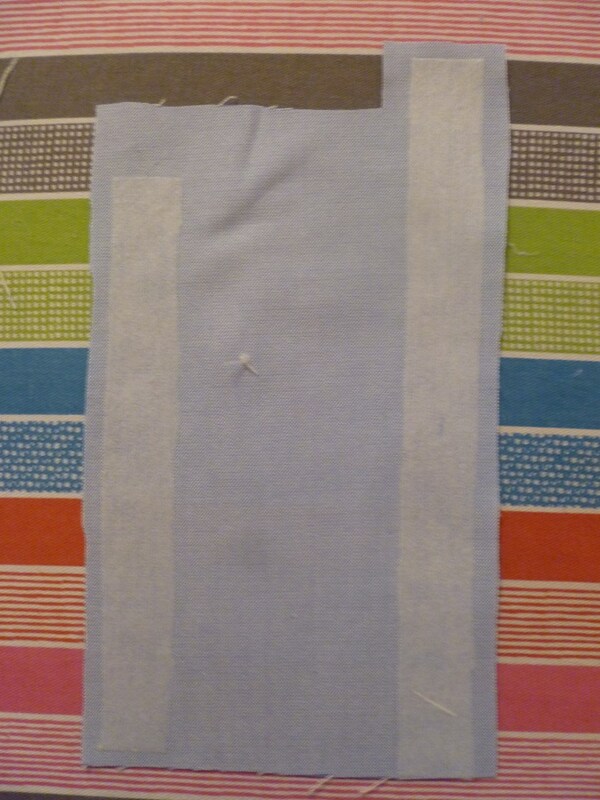 It was only 6mm and as the placket was going to be 2cm wide I changed this to 10mm on each side of the centre line. So the next sample worked out. I had a lot of excess at the base which I just trimmed down before folding the seam allowance under and doing the box stitch. I think I’ll leave the pattern as it is as you can always trim off but can’t add on. You can see a tiny bit of the under placket poking out at the base so I think to avoid this I’ll widen the top placket just by a few millimetres so it can cover the edge of the under placket. So for something that I thought would be a bit of a faff turned out to be quite simple.